Sherlock Holmes and Dr. Watson meet Tarzan? Sure, why not? It certainly makes for sensational cover art. 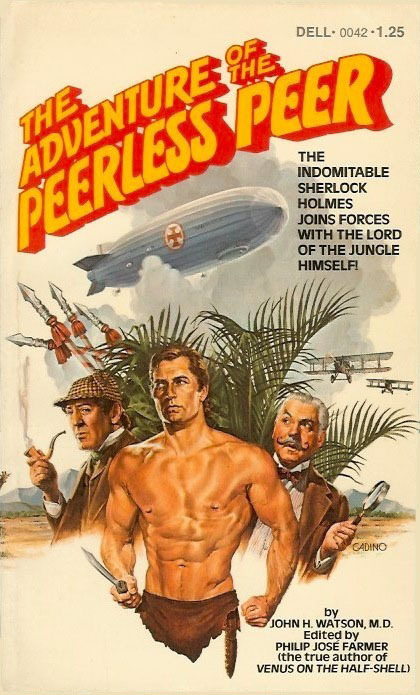 The Adventure of the Peerless Peer was first published in hardcover by Aspen Press in 1974. This is the 1976 Dell paperback. Holmes and Watson take to the skies in quest of the nefarious Von Bork and his weapon of dread––a night sky aerial engagement with the deadly Fokker nearly claims three brilliant lives––the astonishing careers of the two American air aces are illuminated––and an historic alliance is formed, whereby Baker Street's enigmatic mystery-solver and Greystoke, the Noble Savage, Peer of the Realm and Lord of the Jungle, team up to bring down the Hellish Hun! Check out the great site I Hear of Sherlock Everywhere for a related Holmes-Tarzan post: Sherlock Holmes vs. Tarzan — by the Numbers.